We learned loads about the beautiful, talented people of China during these Olympics, and perhaps even more about its cheating, lying, oppressive government. The more the Chicoms tried to appear as another ordinary government, the more their decaying Communist yoke showed. "Birds Nest, in the Style of Cubism," a painting by Zhang Hongtu, is now at the Lin & Keng Gallery in Taipei, awaiting shipment back to New York. The ashen-brown picture shows the gleaming new Olympic stadium, designed by the Swiss architects Herzog & de Meuron, as Piranesi might have imagined it and Picasso painted it -- as a decaying ruin rendered in fragmented angled forms. 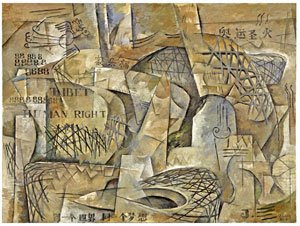 On the canvas, cubist-style, are inscriptions in English letters and Chinese characters: "Tibet," "human right" and the Olympic motto, "one world, one dream." The painting was supposed to be in Beijing during the Olympic Games, in the exhibition "Go Game, Beijing!" organized by a Berlin marketing firm and displayed at the German Embassy. But it was seized by Customs on arrival and denied entry as "unacceptable" for its color, its depiction of the stadium, and its inscriptions.